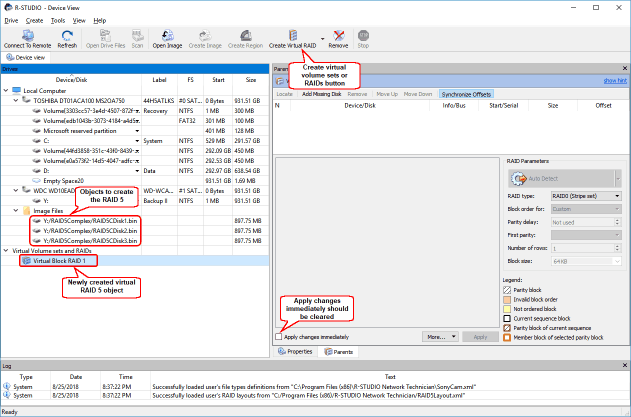 R-Studio detects and treats valid software or hardware RAIDs as regular drives/volumes. But what to do if you have only drives or drive images of a faulty RAID? 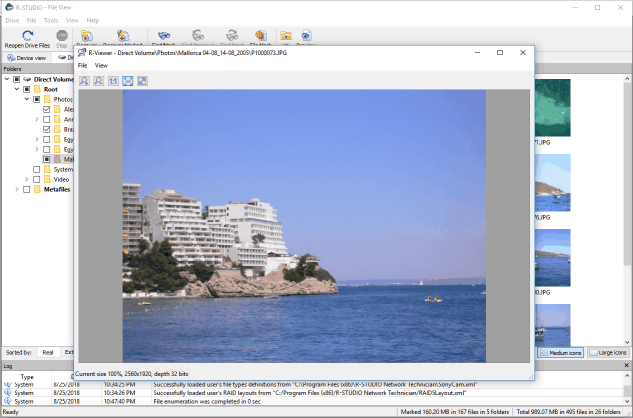 R-Studio can still help you to get the data back, provided that the drives necessary for the RAID to operate are working or you have the images of those drives. The number of drives needed in order to get data back depends on the RAID layout. For example, for a mirror (RAID 1) of two drives, at least one must be valid, whereas for a RAID 5 of three disks, the number of valid drives should be two. 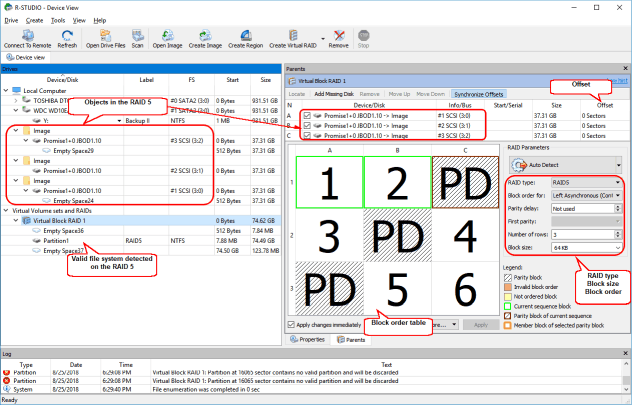 Working with RAIDs in R-Studio is based on the concept of virtual volume sets and RAIDs. 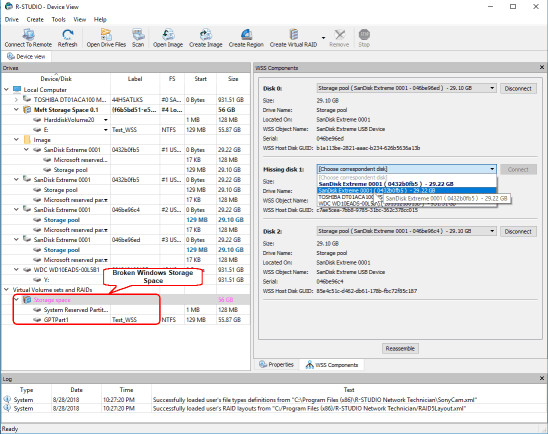 That is, you can construct the original RAID from its drives and/or drive images in R-Studio and process it as you would any other device object. Such a virtual object can be searched for files and scanned, and files found on it can be recovered in the same way that they would from normal drives/volumes. Virtual RAIDs can be constructed using any device objects visible to R-Studio, be they hard drives, logical disks, or images. Please note that virtual volumes and RAIDs are purely virtual objects, and R-Studio does not write anything on the devices from which such objects are created. You can read more about working with RAID in R-Studio on-line help: Volume Sets and RAIDs. 1. Click the Create virtual volume sets or RAIDs button and select Create Virtual Block RAID. 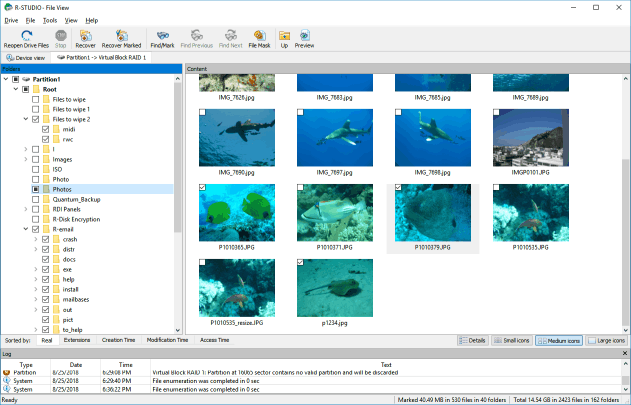 The newly created virtual RAID5 object will appear on the Drive pane, and the Parents tab will appear on the R-Studio Main panel. Check that Apply changes immediately is selected. 2. Drag the objects from which we want to create the RAID5 to the Parents tab and place them in the correct order, that is, SCSI(3:0), SCSI(3:1), SCSI(3:2). 3. 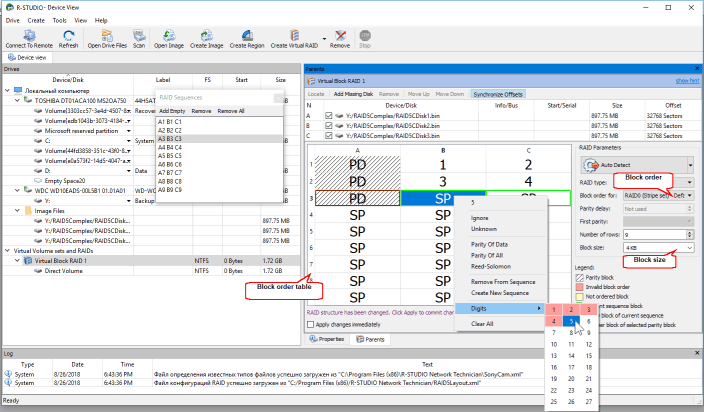 Specify the correct blocks order and offset (in sectors). As soon as R-Studio detects a valid file system, a new Partition 1 object will appear on the Drive pane. We may process this partition as a real object. Let's enumerate the files on that partition. Just double-click the object and see the folder/file structure on the virtual RAID 5. We can check that we constructed the RAID5 correctly. 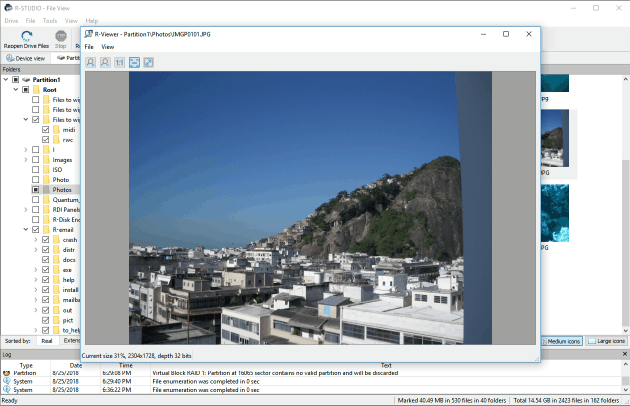 Just double-click a graphic file, and R-Studio will show its preview. For our case that minimum file size would be 64KB (the block size) three disks minus one disk (2), which comes to 128KB. You may read about how to find RAID parameters in our articles: automatically: Automatic RAID Parameter Detection or manually: Finding RAID parameters. You may also create your own RAID configurations, save them, and then edit and reload them. If some of the objects are missing, you may substitute them with Missing Disk or Empty Space objects. For details, see R-Studio on-line help: Working with Advanced RAID Layouts. You may turn the objects in the virtual RAID or volume set online and off-line by selecting/clearing the On check box on the Parents tab. 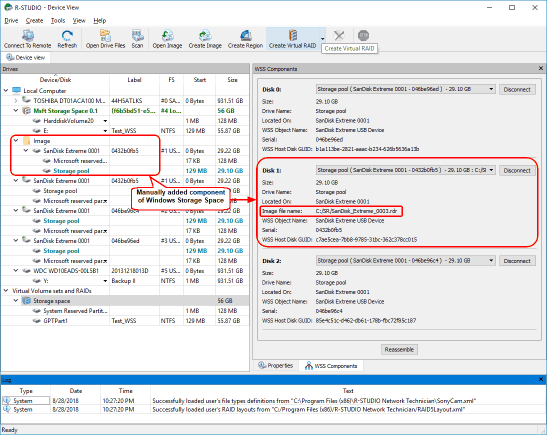 It may be useful, for example, if you need to see which disk is non-actual in a RAID 5. Actually when you turn an object off-line, R-Studio substitutes it internally with a missing disk object equal to the size of the offline disk. Now we can proceed with a more advanced example. 1.Click the Create virtual volume sets or RAIDs button and select Create Virtual Block RAID. The newly created Virtual Block RAID object will appear on the Drives pane, and the Parents tab will appear on the R-Studio Main panel. Check that Apply changes immediately is cleared, as we will be doing a lot of editing here and there is no reason to have R-Studio execute changes unless we are through. 2. Drag the objects from which we want to create the RAID 5 to the Parents tab. Then place them in the correct order, that is, Y:\Disk1.dsk, Y:\Disk2.dsk, Y:\Disk3.dsk. Select Custom in the RAID type, and enter the block size and offset on the Parents tab. Disregard the Block order field for the time being. Enter the block order in the table on the Parents tab. 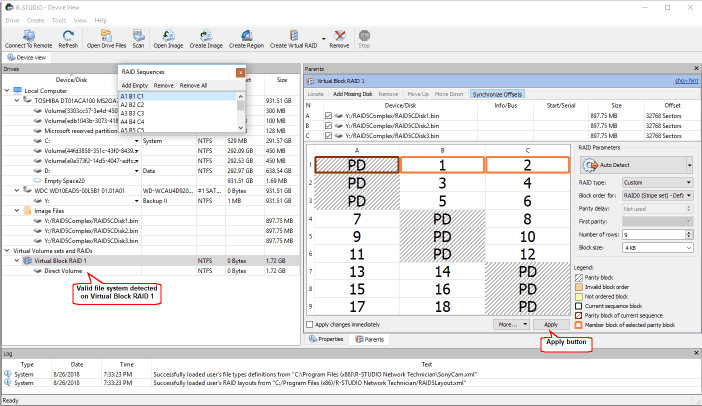 Use the RAID Sequences window to navigate through the table. Using the keyboard: Arrow keys to navigate, digit and P keys to enter the block order. Using the mouse: Right-click the cell and select the number or parity from the shortcut menu. If the block table is too large, you better use the keyboard to enter the digits. 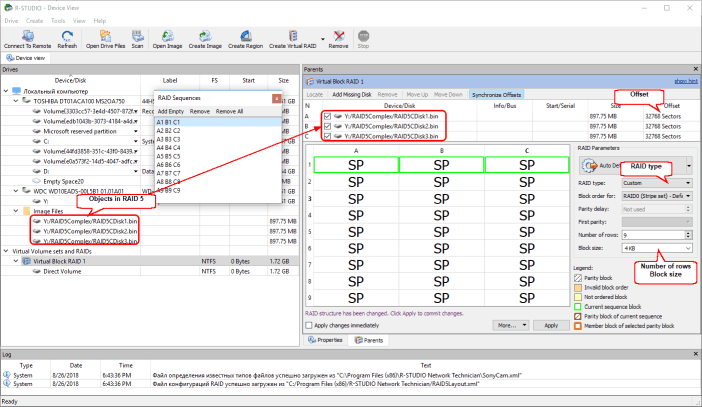 Corrections: R-Studio will indicate if some digits are not correct by marking the cell with the red color Navigate to the required cell and enter the correct value. Use the Delete key to clear a cell. Clear the table: Right-click the table and select Clear all on the shortcut menu. 4. When we finish filling the block order table, click the Apply button on the Parents tab. As soon as R-Studio detects a valid file system, a new Direct Volume object will appear on the Drive pane. We may process this partition as a real object. Let's enumerate the files on that partition. Just double-click it and see the folders/files structure on the virtual RAID 5. We can check that we constructed the RAID 5 correctly. Just double-click a graphic file, and R-Studio will show its preview. You may also create your own RAID configurations using a description file for RAID configurations. See R-Studio on-line help: Syntax of a Description File for RAID Configurations for details. 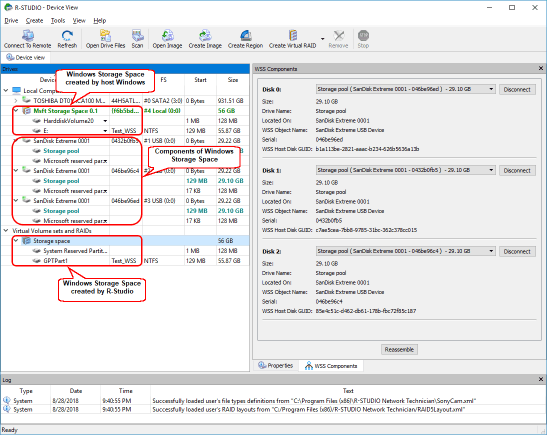 Volumes created by various disk and volume managers. 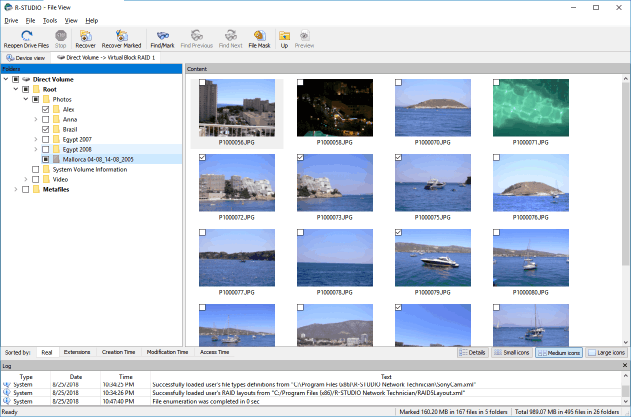 R-Studio can automatically assemble them even when their databases are slightly damaged. If some components are damaged so severely that R-Studio cannot recognize them, they can be added manually. You may read more about working with such objects in R-Studio's online help: Various Disk and Volume Managers. For example, we#39;ll let R-Studio assemble a Windows Storage Space (WSS) configured as a parity device. When the WSS components are connected to the computer, R-Studio recognizes and assembles them into a WSS automatically. Note that it may be two instances of WSS (or other object recognizable by host Windows), one assembled by R-Studio, the other by Windows itself. Their content may be quite different, if the file system of that object is damaged. When the WSS is selected, R-Studio highlights its components. It also highlights the storage space that Windows may itself create from the same components. 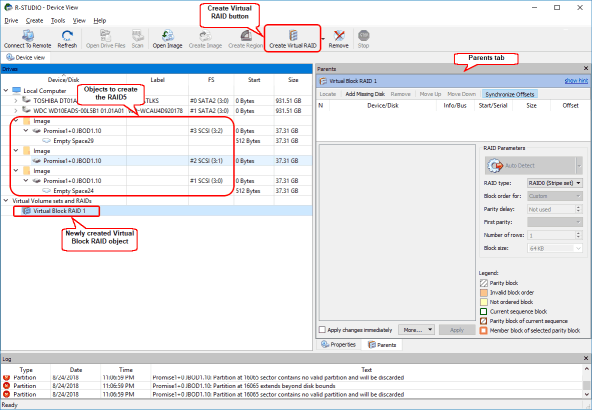 The WSS Components tab allows you to manually disconnect or connect the components, for example, if they are such damaged that R-Studio cannot recognize them as parts of a WSS. Select the object from the drop-down box and click the Connect button. R-Studio displays the objects it recognizes as the components of the storage space in blue. You may immediately switch to the storage space configuration that R-Studio believes is most probable by clicking the Reassemble button.